Beer Blog or Cheese Blog? I just had to post a couple pics from our hop harvest today. I’m so proud of my husband — these hops are his babies that he started last spring. We had a small yield last year but this year’s crop is pretty damn good! 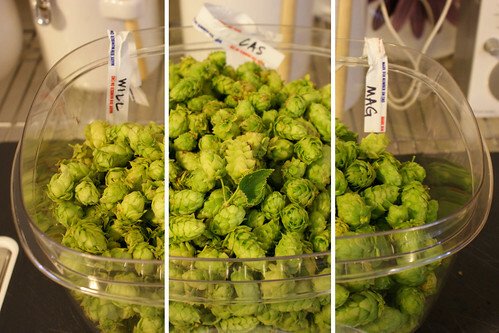 We have Willamette, Cascade & Magnum hops. 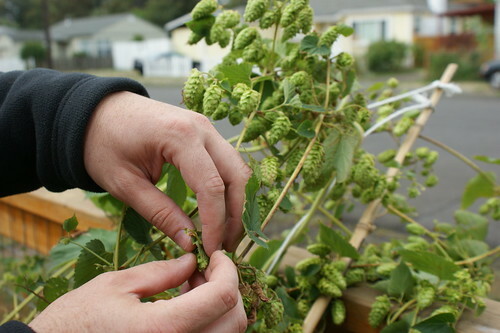 Cascade were the highest yield but overall we got over a pound of hop cones. You know how I feel about cheese and beer together so I’m just tickled to make some homebrew from our very own hoppy hops! I wonder what cheese I can pair with this? I think a cheese festival is second only to a puppy festival in terms of how awesome it would be to have one. Sadly, there is no puppy festival this year. Only a cheese festival! Hooray! Mark your calendar for Saturday, October 3, 2009. The Wedge Cheese Festival will be held at the Green Dragon Pub on SE 9th and Belmont. The whole street will be closed and cheesemakers from around the Northwest — Oregon, Washington, Idaho & California — will be there. This is a great chance to sample and buy cheeses that are the best in the region and some that are impossible to get anywhere else! More info can be found at the official Wedge PDX site. I cannot wait! Our cheese plate, click to see which cheeses are which. I’ve been waxing poetic about Foster & Dobbs to everyone I know lately as I really think they have a great thing going. This little cheese shop in Northeast Portland has an excellent case of cheese as well as everything you need to go with it. I got together with the FUCheese ladies last week to celebrate National Goat Cheese Month with a plate from Foster & Dobbs. You can buy cheese to go or sit down and eat it there. 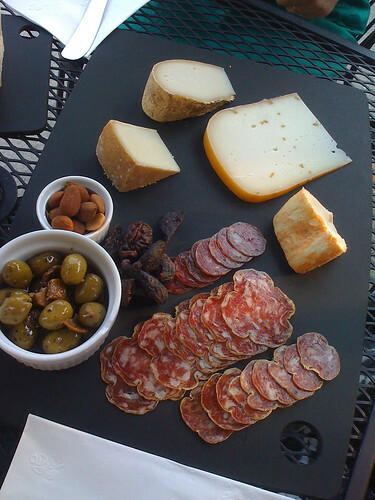 They helped us choose an array of goat cheeses plus some charcuterie and a side of almonds, olives and figs. We shared a bottle of chilled pinot gris and took the whole thing out to enjoy on their patio. Fantastic! They also have a ton of amazing jams, chocolates, caramels, etc., and their menu also includes some amazing sandwiches (goat cheese and chocolate panini? yes, i will!). If you are in the area and haven’t checked them out now is a great time — their summer hours keep them open till 8 pm through September 30, the perfect way to unwind the day. Oh, I want to go there right now! 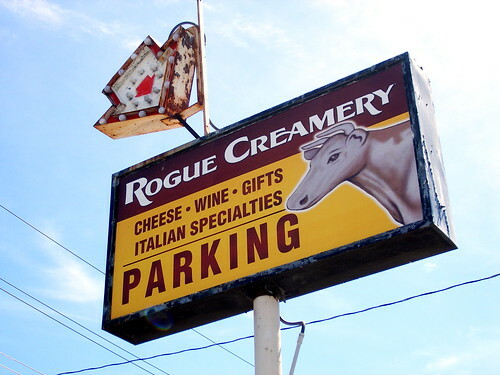 Rogue Creamery just took top prize at the Amercian Cheese Society annual conference with their Rogue River Blue. Back in March, we got to sample this wild cheese at the Cheese Guild Cheese Festival. It’s a smokey, figgy cheese wrapped in grape leaves which have been soaked in pear brandy. Truly unique in the world of cheese and definitely special for Oregon. 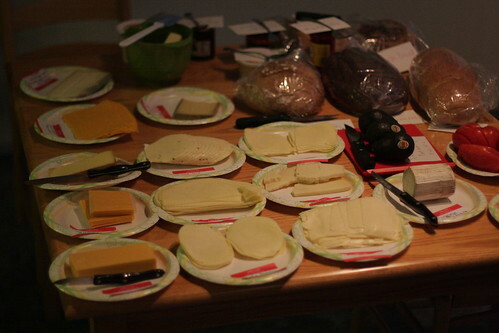 Tom Vorhees from the Rogue Creamery and Steve Jones of Steve’s Cheese also won the cheesemongering competition. I’m not at all surprised there as Steve has one of the best cheese cases around and is so knowledgeable and approachable that they couldn’t help but win. You can read more about the competition over at the Pacific Northwest Cheese Project. Congratulations to everyone! I think I’m going to have to start putting aside my pennies so I can attend next year. If nothing else, just to see the festival cheese room would be worth it. 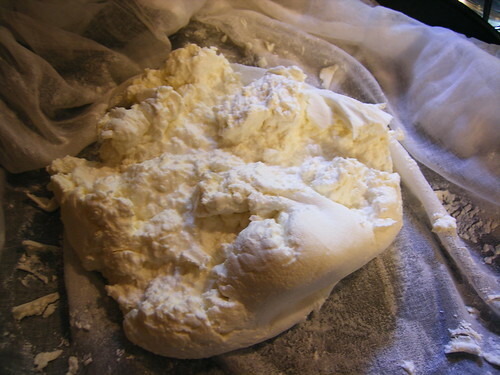 The main steps in making cheese are generally heating the milk followed by cutting the curds and then draining the curds to get rid of the whey. The less moisture in the cheese, the firmer and denser the cheese will be and the longer it can age. If you are making cheese at home, any of these steps can seem daunting, but sometimes the thing we have the most trouble with is the seemingly simple task of setting it up to drain properly. The most obvious thing to do would be to have a hook in your ceiling over your sink which would allow the whey to flow right down the drain or be captured in a stock pot for another use. However, because of the soffit in my kitchen and the placement of the sink under it, this proved impossible. You may have other limitations. This post is a roundup of some of the devices we have conjured to drain our cheese. Okay, not to beat a drum but we went to another cheese and beer tasting event last night and it was EPIC. Going in knowing that the menu would include 10 pairings, I was a bit intimidated. Luckily, both the beers and cheeses were more on the mellow side, lighter beers without super complex flavors and cheeses that were all unique but none that really knocked your palette out. 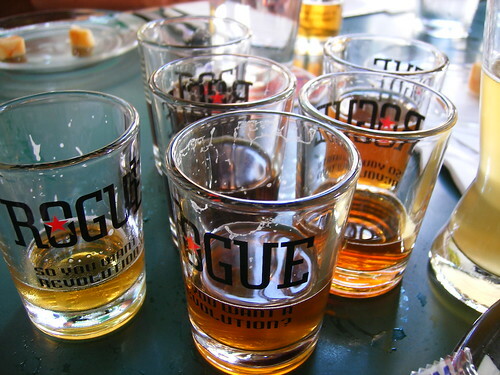 We also sampled Rogue’s new whiskey which was pretty darn good as whiskey goes. I could definitely see taking it on a camping trip which is my metric for tasty whiskey. 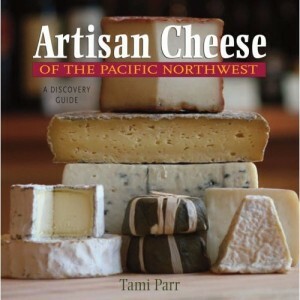 Tami Parr, as I’m sure you know, is the voice behind The Pacific Northwest Cheese Project and is also very active with the Oregon Cheese Guild. She is an excellent writer and she puts those talents to the page with Artisan Cheese of the Pacific Northwest. The guide covers about 75 cheese makers in Oregon, Idaho, Washington and B.C. It’s organized by state and has a great map so you can see when you’re nearing Mt. Townsend Creamery and plan accordingly. I plan to keep this in the car and the more I refer to it the more I’ll be reminded that life is good. So, the Mister and I are big beer fans around here. He has been homebrewing for a couple years and I swear that he has never made a bad beer. There has been one or two strange beers but nothing undrinkable. In fact, most of them have been highly drinkable! When I started getting interested in making cheese I felt like there was some kind of crossover potential there. They both relate to the science of applied heat. They both relate to farm life — beer is made from grains, cows eat grains and grasses. But, obviously, these are tenuous connections. The light came on, though, when I started reading about pairing cheese with beer. The first step to coming to terms with the fact that you’re a cheese nerd is admitting it. The second step is getting something to haul around your cheese purchases. Before we went down to the Oregon Cheese Guild Fest at the Rogue Creamery, I bought a small Coleman cooler to stash our cheese purchases so that they would keep over the next day and the long car ride home. I threw in a little cold pack and then I didn’t have to worry about my cheeses. When Nicole and I went to the Seattle festival, I brought the cooler then, too, but left it in the car. It was a hot, glorious day and I definitely would have needed to make use of it if we had bought anything. But, strangely, we didn’t buy anything at the festival. If we had, it would have been a bit unwieldy to carry the thing around and annoying to truck back to the car which wasn’t quite nearby. So… delight! I just came across these insulated lunch bags from Mario Batali that would be perfect for a festival or farmer’s market. 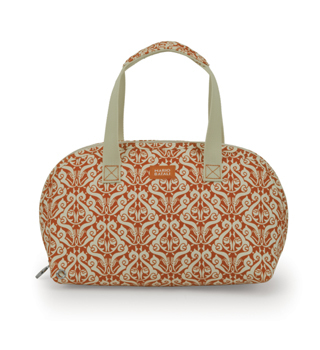 The Margherite Satchel in persimmon would be perfect for a few wedges of cheese and totally fashionable. 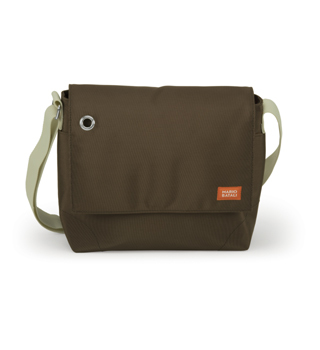 The Tufoli Messenger is understated and could go from farmer’s market to daily commute with no problem. It’s got a few different pockets so you could pack your lunch and hide away all your other daily stuffs. The prices are great, too, ranging from $28 – $55. These would make great gifts! Oh, which one to get?! I wonder if grilled cheese is the bacon craze of ’09. I feel like I’m seeing grilled cheese everywhere! As a long-time aficionado, I support this trend. I recently came across Melody Kramer’s Flickr photo set of a grilled cheese party that she pulled off with some amazing ingredients. She put together an array of breads, some fancy extras including the rather scary-sounding “lardo” and a staggering array of cheeses. What a great idea! Click the image above to get her annotated Flickr photo and more photos of grilled cheese heaven.